Sleep-caused car accidents are almost always the fault of the drowsy driver who has a legal duty of care. Drivers have an obligation to drive safely—being mindful of the safety and wellbeing of themselves and others. Drivers that fall asleep at the wheel have violated their legal duty of care and are legally responsible for the damages they cause. Victims of these types of collisions often must engage with an attorney who has specific experience with asleep-at-the-wheel accidents. If you or a loved one has been injured in an accident our legal staff is here to help you better understand your legal rights so you can start your journey to justice. Call Davis Law Group at (206) 727-4000 or use the contact form on this page to schedule a free consultation. Davis Law Group has represented countless victims of motor vehicle accidents caused by a drowsy driver that fell asleeep at the wheel. If you have been injured by a driver who fell asleep and caused an accident, it may be in the best interests of you and your family to consult with an attorney about your legal options. Attorney Chris Davis is one of the most respected and recognized civil litigation lawyers practicing in Washington State. Davis Law Group has been named Best Injury Law Firm in Washington State by AI Dispute Resolution Awards and Best Traffic Accident Firm in Washington State by Legal Elite for commitment and excellence in serious motor vehicle accident claims. “Drowsy driving” occurs when a person who is operating a motor vehicle is too tired to remain alert. As a result the driver may have slow reaction times, reduced vigilance and impaired thinking. In the worst case the driver may fall asleep behind the wheel. Davis Law Group has represented countless victims of motor vehicle accidents caused by a drowsy driver that fell asleep at the wheel. If you have been injured by a driver who fell asleep and caused an accident, it may be in the best interests of you and your family to consult with an attorney about your legal options. Call Davis Law Group at (206) 727-4000 or use the contact form on this page to schedule a free consultation. Sleep-caused car accidents are almost always the fault of the drowsy driver who has a legal duty of care. Drivers have an obligation to drive safely—being mindful of the safety and wellbeing of themselves and others. Drivers that fall asleep at the wheel have violated their legal duty of care and are legally responsible for the damages they cause. Who’s causes drowsy driving accidents? Drivers who use medications that make them sleepy. Drivers who do not get enough sleep. Semi-truck & tractor trailer drivers. who operate vehicles such as tow trucks, tractor trailers, and buses. Shift workers (work the night shift or long shifts). Drivers with untreated sleep disorders such as sleep apnea. Drowsy driving crashes are most frequently cases by commercial truck drivers; shift workers; drivers with sleep disorders (sleep apnea); drivers taking sedative medications; and those who don’t get adequate sleep. According to a study by Federal Motor Carrier Safety Administration, a third of semi truck accidents are caused by truckers falling asleep behind the wheel. More than a third of drivers report having fallen asleep behind the wheel at some point in their lives, and more than one in ten has fallen asleep behind the wheel in the past year. A third of US adults report that they usually get less than the recommended amount of sleep. Studies have show that about 20 percent of fatal motor vehicle accidents in the US involve a drowsy driver. According to a study by the AAA Foundation for Traffic Safety, drivers who sleep only five or six hours in a 24-hour period are twice as likely to be in a motor vehicle collision as drivers who get seven or more hours of sleep. The U. S. National Highway Traffic Safety Administration (NHTSA) reports that drowsy driving is related to at least 100,000 motor-vehicle crashes and more than 1,500 deaths per year. About 71,000 drowsy-related crashes involve non-fatal injuries. The estimated annual monetary loss related to drowsy driving is about $12.5 billion. Drowsy driving often goes unreported when police complete an accident report. Unless the driver admits falling asleep, drowsy driving can be difficult to detect. In 2014 there were at least 846 fatalities that were drowsy-driving-related in the US. These reported fatalities (and drowsy-driving crashes overall) have remained largely consistent across the past decade. Between 2005 and 2009 there was an estimated average of 83,000 crashes each year related to drowsy driving. The National Highway Traffic Safety Administration estimates that 2.5% of fatal crashes and 2% of injury crashes involve a driver that has fallen asleep-at-the-wheel. 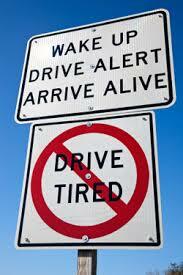 Other organizations estimate that 5,000 or 6,000 fatal crashes each year may be caused by drowsy drivers. The following represents the serious injury and fatality data for drowsy-driver-involved crashes over the last 10 years in Washington State as reported by the Washington State Department of Transportation. Currin, Andrew. "Drowsy Driving Crashes and Fatalities." National Highway Traffic Safety Administration (NHTSA). U.S. Department of Transportation, 02 Mar. 2017. Web. Bunn, T. L., S. Slavova, T. W. Struttmann, and S. R. Browning. "Sleepiness/fatigue and Distraction/inattention as Factors for Fatal versus Nonfatal Commercial Motor Vehicle Driver Injuries." Accident Analysis & Prevention 37.5 (2005): 862-69. Print. "Drowsy Driving: Asleep at the Wheel." Centers for Disease Control and Prevention. Centers for Disease Control and Prevention, 05 Nov. 2015. Web. National Center on Sleep Disorders Research (NCSDR), National Highway Traffic Safety Administration (NHTSA), and National Institutes of Health. "Drowsy Driving & Automobile Crashes." National Highway Traffic Safety Administration. U.S. Department of Transportation, 1998. Web.